Analyzing the general characteristics of aviation terrorism from the late 1960’s to the 1980’s shows that the major role of the aircraft was emphasized by a combination of two main elements. The first is the rationality factor, which was expressed in the release of prisoners resulting from a terrorist attack aimed at achieving politically-orientated objectives, such the El-Al hijacking of July 1968. The second element is publicity, which was the hallmark of the TWA hijacking on August 1969 by Leila Khaled and, perhaps the most significant event that establishes this proposed assumption, the Dawson Field incident of September 1970. However, this 'gentle' mode of hijacking seems to have become an archaic tactic, converting the hostages from being pawns on the terrorism chess board to dispensable targets. This is emphasized by the transition from 'rolling action' to 'immediate action'. 'Immediate action', which includes ground attack, ground or air sabotage, MANPADS attack and suicide attacks, is characterized by the fact that no negotiation takes place within the latter mode of air terrorism, unlike 'rolling terrorism', which refers to a negotiation process in which hostages are released after the release of jailed terrorists. 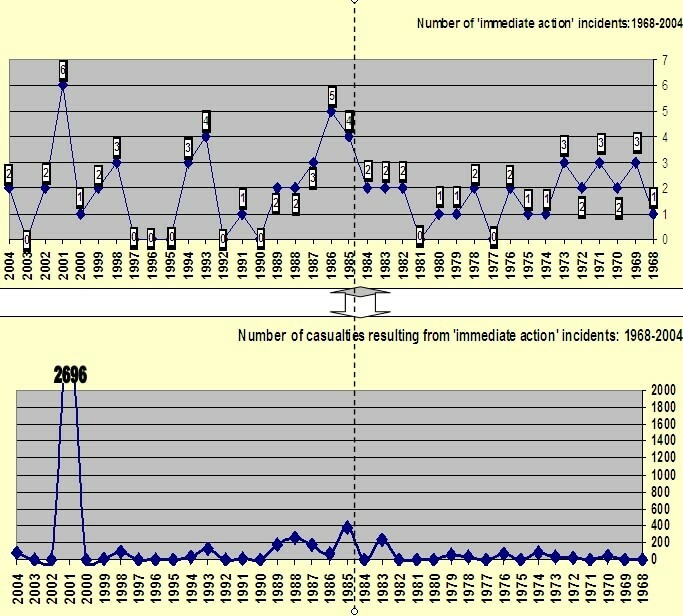 Despite the dramatic increase of 'immediate action' incidents, as indicated in the figure above (left side), the number of casualties has not increased dramatically, except for in the 11 September attacks. This evidence can be explained by the fact that some of the counted 'immediate action' casualties are not known, such as in the case of the Georgian Airways TU-134 MANPADS attack (20 September 1993). Another explanation is that the figure above includes failed attempts, such as the Nezar Hindawi case (17 April 1986), the Air-India flight 301 sabotage attempt where the bomb exploded at Narita airport and the TWA mid-air sabotage (2 April 1986) with only four casualties. Should the aircraft have exploded, the number of casualties would have reached more than a hundred. The same is true of Richard Reid's attempt to blow up the American Airlines Boeing 767 in mid-air (22 December 2001). In other words, the figure above indicates the unquestionable dramatic rise of 'immediate action' incidents. Regarding the number of casualties, the figure indicates actual casualties rather than potential casualties. It is obvious that the terrorists who committed the 'immediate action' attacks were aiming at causing mass casualties, otherwise they would have chosen a 'softer' tactic, such as hijacking. As indicated, the impact of ‘immediate action’ and adopting the aerial suicide mission represents the mass-casualty potential of such a tactic, as demonstrated by Al-Qaeda on September 11th, 2001. From this point of view, it would be worthwhile dividing the term 'immediate action' into two. The first is sabotaging the aircraft or downing it with MANPADS and the second is using the aircraft as a guided missile to be crashed into selected targets. As to the former tactic, it is a practice that was generally linked to secular terrorist organizations, such as the PFLP-GC, UNITA, Sikh terrorists (who are not defined as 'fundamentally religious'), North Korean terrorists (who are definitely not 'fundamentalist religious terrorists') and state-involvement such as in the cases of Libya (the Pan-Am sabotage) and Syria (the 'Nezar Hindawi' case, April 1986). Regarding the PFLP-GC, one may argue that Jibril's cooperation with the Iranians in the late 1980s may represent a fundamentalist affiliation. This argument has no solid ground, since Jibril was the first Palestinian to adopt the sabotage tactic using barometric triggers, in which he specialized. In that period, (early 1970’s), there was no fundamentalist Islamic influence since the Iranian revolution took place only in 1979, so the general affiliation of the PFLP-GC was secular and Marxist-Leninist orientated. On the other hand, it is worthwhile mentioning that fundamentalist religious terrorist organizations also used 'traditional tactics' such as hijacking, as in the case of TWA’s flight 847 hijacking to Beirut (June 1985) or HUM’s (Harakat Ul-Mujahidin) hijacking of the Air-India Airbus (24 December 1999). These organizations are Islamic orientated fundamentalists and HUM is a member of Osama Bin Laden's international Islamic front. Despite this fact, HUM used 'rolling action' (hijacking) rather than 'immediate action' (total destruction by using the aircraft as a flying missile). [iv] Still, actual evidence shows that the practice of using the aircraft as a flying missile is exclusively affiliated with fundamentalist religious terrorism frameworks. Despite the fact that the first to crash an aircraft into a strategic target were the Japanese Kamikaze ('Divine Wind') during the Second World War, it was not considered terrorism since it was aimed at military targets. Another incident was an attempt rather than an actual suicide mission - in 1972, in what is considered a criminally-orientated hijacking of the Southern Airways jet en route from Birmingham, Alabama (USA) to Montgomery, hijackers threatened to crash a Boeing 727 into the Oak Ridge nuclear reactor. Yet, these incidents were not terrorist-orientated events, so Bin-Laden’s 2001 attack is the first ever example of using an aircraft as a flying missile. 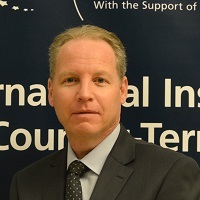 Since these cases are more likely to be regarded as a possibility since it is difficult to determine the terrorists' real intentions, the aforementioned threats may be categorized more as theoretical rather than substantial. As to the latter case of Taufik Fukra, the theoretical assumption as to his intention to crash the jet into a building in Tel-Aviv seems to be “wishful thinking” rather than a solid intention since the hijacking attempt occurred as the aircraft was approaching Istanbul. Should he have had the intention of crashing the aircraft into Tel-Aviv, he could have tried to do so after take off from Tel-Aviv. It seems that the incident and its consequences are more likely to be related to the imitation/inspiration element rather than an actual suicide mission. The first solid evidence of terrorists planning to crash a hijacked jet into a strategic target was the Air-France hijacking by the GIA (December 1994). It was discovered that the terrorists had intentions to crash the jet into the Eiffel Tower after having first landed in Marseilles. This argument is based on the fact that the terrorists demanded the refueling of the Airbus jet with 27 tons of fuel when only a third of this amount was needed for the short flight from Marseilles to Paris. In addition, one of the terrorist leaders later admitted that, indeed, the intention had been to crash the jet into the Eiffel Tower. But, as previously emphasized, the first actual occurrence of using an aircraft as a guided missile was the September 11th, 2001 attack conducted by nineteen suicide terrorists. Relying on solid evidence, it is possible to assume that this new type of operation using the aircraft as a guided missile alongside a deliberate intention of suicide is connected exclusively to fundamentalist religious terrorists, in this case Al-Qaeda. Deliberate suicide involving the deaths of many others was first demonstrated in ancient times following Samson's last statement: “Let me die with the Philistines”. [vi] Ironically, Samson’s act was replaced by those of the terrorists and the Philistines replaced by Western citizens. In fact, religious terrorism may offer justification for mass murder as well as self-sacrifice (in Arabic -'Istishad' ) while the use of aerial terrorism during the 1960’s and 1970’s was characterized by the absence of terrorists' self- sacrifice. The latest evidence of abandoning the traditional tactic and adopting the tactic of using the aircraft as a guided missile became a potential threat in the 1990s, but with actual implementation only in the third millennium (i.e. the September 2001 attack). This may be related to the fact that terrorists' are more and more willing to blow-up the aircraft over a strategic target in a deliberate suicide operation. Unfortunately, there is no guarantee that ‘immediate action’ attacks characterized by the use of the aircraft as a strategic agent together with deliberate suicide will be the monopoly of fundamentalist religious terrorists. If Chechen terrorists, Tamil Tigers and the Kurdish PKK adopt the culture of suicide, one may see that once fundamentalist religious terrorist groups have proved to have no limits in their activities, it is more likely that other terrorist groups, secular as well as religious, will adopt the 'suicide culture'. If Chechens and Tamil Tigers use men and women as suicide bombers, why not transfer this tactic to the aviation field? Hence, imitation and escalation are integral elements within terrorism in general and aviation terrorism in particular. The presence of fundamentalist religious terrorism regarding aviation terrorism, as argued previously, became evident on September 11th, 2001 and was followed by Al-Qaeda activist Richard Reid who attempted to blow up an American Airlines jet in mid-air (December 2001) as well as a series of plots in 2002 and 2003 to use an aircraft for the purpose of causing mass-murder resulting in total destruction of the aircraft. These facts clearly answer the research question as to the shifting perception of the civilian aircraft from an objective to a strategic tool, inferring that the purpose is not just to sabotage or down the aircraft, but to increase casualty potential by using the jet as a guided missile in a deliberate suicide mission, a practice that is currently exclusive to fundamentalist religious terrorism. This issue may be transferred to another aircraft aspect, which is the future role of cargo aircraft. Regarding Al-Qaeda's mode of using the aircraft as a strategic tool, an interesting issue was pointed out by Norman Rabkin (2004), managing Director of the Homeland Security and Justice Issues, in his testimony before the US Senate, claiming that the September 11th terrorists were studying the possible use of crop dusters to spread biological or chemical agents [ix]. This means, first used by the Aum Shinrikyo (20 March 1995) highlights the possibility of shifting terrorism from the traditional role of the aircraft to a new degree of atrocity by using the aircraft as an agent for the distribution of WMD. The adoption of 'immediate mega action' rather than 'rolling action' reinforces the understanding that the traditional terrorist method of using the passengers as a bargaining chip or using negotiation tactics in order to achieve goals is becoming less and less a common practice. By shifting to 'immediate action', neither negotiations nor the passengers as a bargaining chip have a role within this new action. Following the suggested assumption that involves abandoning hostage taking as a bargaining chip in order to use the aircraft as a target (bombing) or as a strategic agent (guided missile), a hijacked cargo jet may be used as a means for spreading WMD. The possibility of using the aircraft as a guided missile (or using it as an agent for spreading WMD) may be implemented through the use of private airplanes rather than large commercial jets where terrorists will seek to use private airplanes, where security measures are loose. Since security measures after the September 11th attacks were extensively strengthened, terrorists might seek the weak link and private airplanes, which may be capable of spreading WMD or may be loaded with explosives to be crashed into selected targets, may become a possible scenario, thus leaving large commercial jets for different and known tactics such as sabotage or MANPADS attack. Recent evidence shows that the LTTE have managed to acquire an aircraft from East Europe and bring it to Sri-Lanka after preparing a landing field. This fact was noted by Bahkutumbi Raman, director of the Institute for Topical Studies in India, in ICT's 2005 conference on counter-terrorism. This aircraft may well be used as a flying missile controlled by a suicide bomber. In addition, one may see that terrorists started focusing on other types of aircraft: small, or even Unmanned Aerial Vehicles (UAVs). According to Israeli officials, some UAV's ('Ultra-Lights) were captured in Arafat's headquarters in Ramallah ('The Muqatah') by Israeli forces during the “Al-Aqsa Intifadah” (ICT, 2005). In other words, the aircraft, although not necessarily a commercial passenger jet, may be used as a tool for a mega attack. If one accepts the assumption that terrorists will shift their tactics and may use a [cargo] aircraft as an agent by hijacking it, then Hoffman's argument indeed plays a significant role regarding the threat potential to cargo aircraft. This article referrers to a possible shifting of modes from “hijacking for bargaining” towards a “strategic tool” mode, which was first carried out on September 11th, 2001, where the main aim of the terrorists was to use the hijacked aircraft as a guided missile and cause mass-murder. As argued, aircraft remain a high priority target for terrorists. Unlike terrorist attacks on commercial passenger aircraft, recent threats extended terrorists' focus to private aircraft because it may be a useful tool for dispersing WMD or loading it with explosives and crashing it into selected targets, alongside with its tremendous impact on various fields of social order. [ii] Paul Wilkinson,(2001) "Terrorism Versus Democracy', London: Frank-Cass. [iii] Hoffman, B. (1998) Inside Terrorism, New York: Columbia University Press. [viii] http://www.whitehouse.gov ,7 October 2005; Associated Press, 2006.